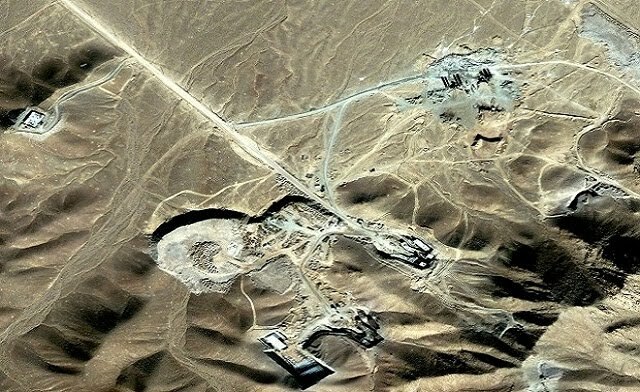 Iran’s Underground Nuke Site Struck? The biggest blow in the covert campaign against Iran’s nuclear program may have just been delivered. It is reported that a mysterious explosion was set off inside the underground enrichment site at Fordo on Monday. The Iranian regime predictably denies the report. Anonymous Israeli officials have confirmed that an explosion took place, but the White House says it doesn’t believe the report is credible. The original report was written by "Reza Kahlili," a former CIA spy inside the Iranian Revolutionary Guards who is now in the U.S. and active in the Iranian opposition. His source is Hamid Reza Zakeri, a former Iranian intelligence officer who defected in 2001. Zakeri claims to have worked in Supreme Leader Khamenei’s Intelligence Office and his information helped convince Judge George Daniels to rule in December 2011 that Iran and Hezbollah hold responsibility for the 9/11 attacks. The Fordo site is about 300 feet under a mountain in order to protect it from aerial attack. It can hold about 3,000 centrifuges, which is far from what is needed for a domestic nuclear program but adequate for nuclear weapons. This is the site drawing the most concern of those that have been publicly disclosed because it is also where Iran is storing the uranium it has enriched to 20 percent. Nuclear expert David Albright says that 20% enriched uranium can be brought to bomb-grade level in as little as six months using 500 to 1,000 centrifuges. The explosion reportedly took place at about 11:30 in the morning inside the third centrifuge chamber that lies above the stock of enriched uranium. The blast disabled two elevators, leaving no way to rescue the 240 personnel stuck inside. The report says that traffic was blocked off for 15 miles and the Tehran-Qom highway was temporarily closed off. There was no evacuation of nearby residents. The Iranian regime denies that any explosion took place. White House Press Secretary Jay Carney said, "We have no information to confirm the allegations in the report and we do not believe the report is credible." Anonymous Israeli intelligence officials, on the other hand, confirmed that an explosion took place and said that the damage is still being assessed. It is difficult to determine the impact of the alleged explosion on Iran’s nuclear ambitions because the program’s full extent is unknown. Kahlili has identified three other secret nuclear sites and a biological weapons site. His sources report that the regime is making progress in warhead production, uranium enrichment and plutonium reprocessing at these sites. He recently provided a briefing on these activities in a RadicalIslam.org webinar on Iran’s nuclear program. The explosion would be just the latest in a series of likely covert operations against Iran’s nuclear program. In January 2012, the number of killed nuclear scientists rose to five. In December 2011, there was an explosion at a steel plant in Yazd. In November 2011, an underground facility next to the Isfahan uranium conversion site was destroyed. That same month, a Revolutionary Guards missile base blew up, killing the top missile engineer. The previous month, an ammunitions stockpile at another Revolutionary Guards missile base at Khorramabad exploded. And of course, there is the famous "Stuxnet" cyber attack on the Natanz centrifuge site. The reported explosion comes as Mohammad Reza Heydari, a former Iranian consul in Norway that defected in 2010, warns that Iran is trying to build two or three nuclear weapons as "insurance" but would use them against Israel or another enemy country. He also said that Venezuela is sending uranium to Iran and that our fears about the regime’s beliefs are warranted. "They are busying themselves with ideological preparations for the arrival of the Hidden Imam and are preparing the ground for that in a practical way, for this purpose, they are willing to spill much blood and destroy many countries," he said. A successful covert strike on Iran’s nuclear program is vital in order to demonstrate strength in the wake of the nomination of Chuck Hagel as Secretary of Defense. Iran expert Kenneth Timmerman reports that "the Iranian regime loves Chuck Hagel" and that its state-controlled press is interpreting his nomination as a sign that the U.S. is eager for a "grand bargain." The Hagel nomination undermines the credibility of the U.S. pledge to stop Iran from getting a nuclear weapon, even if it means military action. In 2006, Hagel said a military strike "is not a viable, feasible, responsible option." The Iranian regime certainly knows of his record, which even includes opposing the designation of the Revolutionary Guards as a Foreign Terrorist Organization. The Iranian regime will also doubt that the U.S. would support Israeli action. In 2006, Hagel criticized Israel’s offensive against Hezbollah, decrying the "systematic destruction of an American friend [Lebanon]" and declaring, "this madness must stop." If Hagel wouldn’t support an Israeli offensive against Hezbollah, then there’s little reason for the Iranian regime to believe he’d support an Israeli military offensive against its nuclear program. We should hope that the report of an explosion inside the Fordo site is accurate. Only strong action will convince the Iranian regime that its enemies are capable and—most importantly—willing to stop it.